Demonstration to product carved shogi piece. 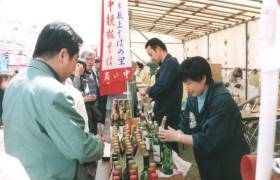 Around the event place, there are many shops of local special products, shogi pieces, Japanese sake, wine, etc. At the shop of shogi pieces, they sell a shogi set(shogi pieces and shogi board) for a half of market price "festival price". 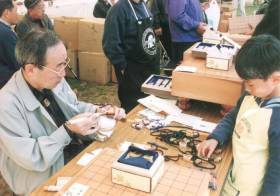 And there is a service to carve your name on a key ring of shogi piece "Netsuke Koma", many tourists make a line in front of craftsman. In Tendo city, there are many variety of special products, not only shogi pieces but also Japanese sake, wine, etc. A wine boom of these days influences it, many people visited at a sampling corner of Tendo wine. Mild and dry, red and white, the promotion arrangeed many variety of wine was popular with tourists. I think you may take an interest when you see that many wines is in a line. Previous "Japanese Drums" <Please choose...> Next "Shops(2)"